Ship's decanters had their beginnings in the early naval sailing ships of the Royal Navy, and it would have been an exception to have found a captain's cabin without one - from the smallest to the largest vessel. 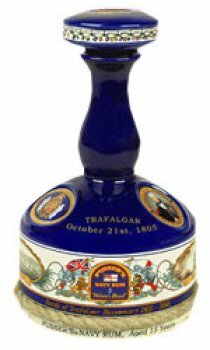 This Trafalgar Bicentenary Decanter has been designed especially to commemorate Nelson and his great victory at Trafalgar. A limited edition of 36,000 units has been produced for distribution throughout the world. Each decanter is numbered on its bottom. The rum in this decanter has been aged for 15 years. It is the finest there is. Savour and enjoy it.